What do I do for School Art & Writing Workshops? “Your presentations were the perfect combination of multimedia and personal interaction with the audience, capturing everyone’s attention while involving them in the program. Working with an illustrator or writer is a great opportunity for children to try out their own creativity in an exciting and meaningful way. Kids have a natural affinity for creativity and, when they are able to work with me in a workshop after seeing my presentation, they make unique connections about what they have learned. 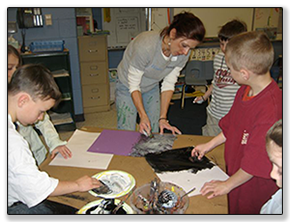 I offer a variety of art and writing workshops and can tailor a hands-on experience for your grade level or classroom curriculum. You can have a basic, single-session hands-on workshop or an experience that creates a project involving various steps, for art or writing or both. I even have an art and writing workshop for Kindergarteners! I also do workshops and conferences for all sorts of educators! An art and writing workshop experience is a fun and educational way to take learning into practice and let your students be authors and illustrators with me during a school visit. 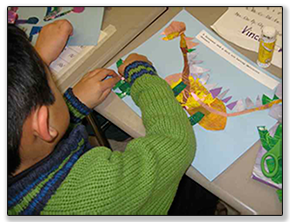 My workshops spring from the pages of my books and encourage kids to be imaginative with their own writing and art in an environment that is not attached to grades or testing but that, nonetheless, reinforces curriculum strands from Language Arts Literacy and Visual Arts. My more intensive Deluxe Publishing Residency Program adds Life Science and Technological Literacy strands for a truly multi-discipline experience. The individual Writing and Collage Workshops are designed for universal success and engender achievement in students of all ages and developmental levels. Utilizing poetic language and writing techniques like alliteration, onomatopoeia, metaphor & simile bolsters classroom academics. My energetic Collaborative Workshops foster shared ownership of a creative project, creative cooperation and a sense of community effort. Murals and poems that children make together are wonderful showcase pieces to display for open houses and family events at your school.